What is the mixed reality home? 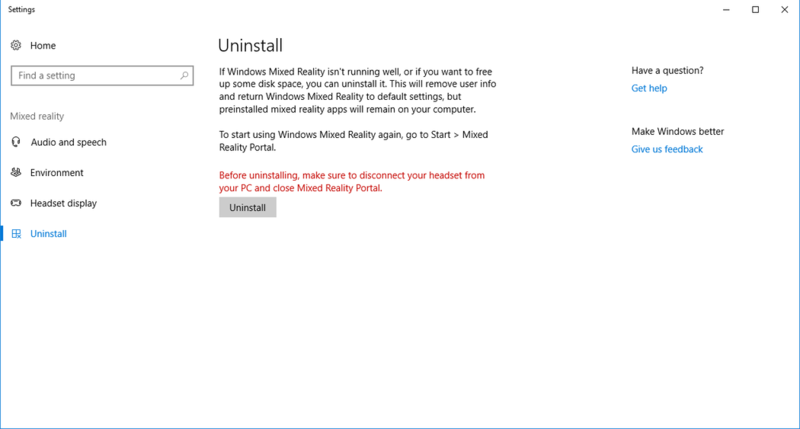 Windows Mixed Reality is the first spatial operating system. Instead of using a flat screen and a 2D interface, it leverages our instinctual ability to navigate three-dimensional space. Every place has a purpose, and content has context. 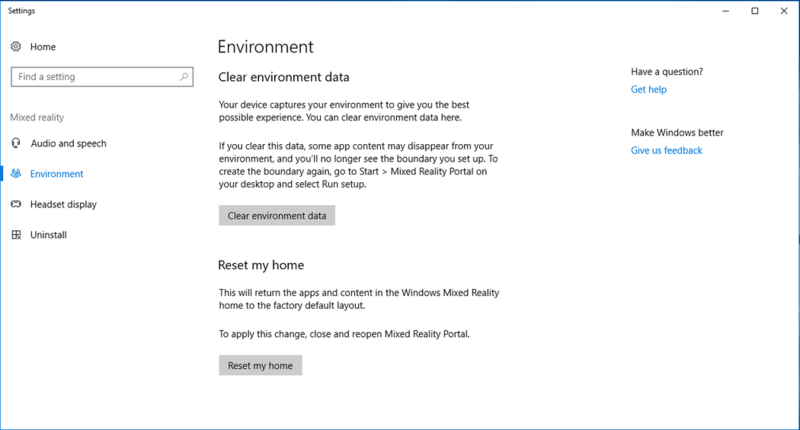 Just as your PC starts at the desktop interface and your phone begins with a home screen, Windows Mixed Reality starts at the mixed reality home. It's an environment that you can navigate and personalize to make your own. It's the canvas for the thousands of apps available in the Microsoft Store. You can multitask with these apps like you've never been able to before--in 3D where space is almost limitless. How do I move through the mixed reality home? Physically walking: If you have setup your headset with a room boundary and have cleared available space to safely walk around, you can take physical steps to move short distances in your home. One step in the real world is approximately a step in the virtual experience. Teleporting (using motion controllers): You can quickly jump to a location by teleporting. Using the motion controllers, you can teleport by pushing the right or left thumbstick forward, aiming towards the direction you want to go, and then releasing the thumbstick. Teleporting (using gamepad): Using a gamepad, you can teleport by pushing the left thumbstick forward. Teleporting (using mouse): Using a mouse, hold down the right-click mouse button and release at your desired location. You can modify the direction you teleport in for all the above inputs by rotating the thumbstick (for the motion controllers and gamepad) or by using the scroll wheel on the mouse. A handy feature is called "Snap to app" that lets you jump to the ideal position to interact with app windows. Simply point you teleportation arc to a window and let go. The system will automatically place you in the ideal location to enjoy the content of that targeted window. Virtually walking: You can virtually move continuously by depressing the thumbstick (you should feel it click) on your motion controllers or gamepad and then moving in the desired direction. Select the app you wish to launch. Place the app where you would like to use it, and it will launch. From now on you can simply click on the 3D model to launch the app. Press the Windows button on your controller to open the Start menu. Browse for an app or game you want, and then click "Get" or "Buy." Alternatively, you can use the "New for you" app to browse for content, which appears as a shopping bag in your mixed reality home. What is the "New for you" app? You may notice that there is a Microsoft Store bag in your mixed reality home. Clicking it will show you new and exciting apps that you can download and/or purchase. How do I personalize my home? You can decorate your home with apps and holograms. Apps can be downloaded from the Microsoft Store. You can also use the Holograms app to place objects in your home. You can adjust the location and size of things in your home by using the Adjust button. You can also use two motion controllers to quickly move and resize items by pointing to any part of a hologram, or the menu bar of an app window, with both controllers and then moving them closer or farther apart. How do I reset my home's furniture and app placement back to default? How do I turn off the boundary? Go to Mixed Reality Portal and open the menu in the upper left of the screen. Select Run Set up > Room Boundary. Switch the toggle to OFF. You should remain seated at your desk if you turn off the boundary. How does spatial sound work in the Windows Mixed Reality home? The Windows Mixed Reality home includes a spatial sound simulation where sound from each app come from the location of the app. As you turn around, or move closer or farther to the app, the sound direction and volume will change, just like in real life. This feature is disabled on PCs with integrated graphics due to the load placed on the GPU.